Muir, Rory. Salamanca, 1812. New Haven: Yale University Press, 2001. 336 pages. Maps, illustrations. ISBN# 0300087195. $35. Hardcover. 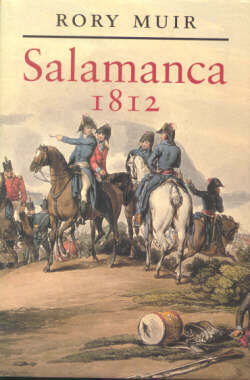 It can be argued that the decisive battle of the Peninsular War, was Salamanca in 1812. There the 51,000-man Anglo-Allied Army under the Duke of Wellington destroyed the 50,000-man French Army under Marshal Marmont. Within a few short hours the French army was in ruins and retreating as rapidly as possible. One French officer described it as the “beating of 40,000 men in forty minutes.” The casualties among the French were horrendous (in excess of 25%), including its three most senior army commanders, who became casualties within a very short time span, leaving the army leaderless at key moments. The battle shook French confidence to such a degree that they never really re-gained the initiative in the war. Madrid would be liberated shortly after the battle (although it would fall to the French again in the autumn), and the French would be forced to evacuate southern Spain, never to return. Salamanca is often referred to the battle that proved that Wellington could fight an offensive battle and is considered by some to be his finest hour. Despite the importance of this battle, only three short books have been written on it in the past two hundred years. Dr. Rory Muir, author of Britain and the Defeat of Napoleon and Tactics and the Experience of Battle in the Age of Napoleon, provides us with the first comprehensive book on the battle. Drawing heavily on primary and archival sources, he provides us with an hour-by-hour description of the battle. Although Salamanca was an overwhelming British victory, whose outcome was probably never in doubt after the first two hours, it had many of hallmarks of a classic British – French Napoleonic battle. There was an epic cavalry charge that destroyed two French divisions, a French cavalry charge that broke a British square, British firepower that decimated French infantry, French infantry attacking British infantry and causing them to flee in panic, and an epic French rear-guard action that saved their army. Dr. Muir quotes extensively from eyewitnesses to bring these events vividly to life. The book contains detailed orders-of-battle (although information on the composition of the French artillery remains a bit of a mystery), appendices on casualties, photographs and a written description of the terrain and battlefield today. There are fifteen black-and-white maps that were specially commissioned for the book. There is a beauty in the simplicity of these maps. They contain only the information that the reader needs to know to describe the action being examined. Key terrain features are easy to pick out and all the units (sometimes down to battalion level) discussed in the text at that point are on the appropriate map. As importantly the maps are located in the book within a few pages of the text they illustrate! In Salamanca, Dr. Muir has done something totally different. The first half of each chapter is the standard battle history. He describes in great detail the action that is going on at a certain time and place. The second half of each chapter, however, is what catapults this book from a “good read” to a “great history!” Here, Dr. Muir examines all of the sources and sorts through them for the reader. He tells the reader how he reconciled the contradictory accounts, judging them by standards that included: whether the source was in a position to see or know what he was writing about, how long after the battle did he write his account, whether he had a hidden agenda for writing his account, etc. Each source is dissected and is accepted or rejected. In short, Dr. Muir explains his methodology. This alone makes the book worth buying! Salamanca sets the standard for future books. The discriminating reader will no longer accept an author’s conclusions without seeing his methodology and examining the evidence himself. Dr. Muir should be congratulated for his innovative approach! I strongly recommend this book not only for those interested in the Peninsular War, but for all readers of military history!